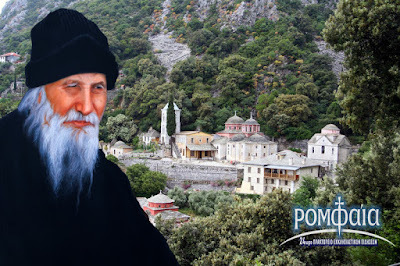 As the festal commemoration of my Holy Elder of Kavsokalyva is dawning, I decided to write a few lines concerning his holy relics, to my beloved host Romfea.gr. The reason for this restoration of the truth and restoring any misunderstanding, was a radio broadcast on November 13th I heard on the channel Peiraiki Ekklesia. The speaker was the Professor of the Theological School of Aristotle University, Mr. Anestis Keselopoulos, who made reference to the exhumation of the Holy Elder Porphyrios, claiming that his spiritual children in Mount Athos threw and scattered his relics beyond the forest. I was close to my holy spiritual father Porphyrios from 1985. And from 1988 in his cell, that of Saint George at Kavsokalyva as a novice monk. Therefore, I was present in the last years of his earthly life, and of course at his repose, and certainly at his burial and exhumation. I have to say from the outset, that our Saint Porphyrios never instructed us to discard his bones. Instead he gave us clear instructions on what exactly we should do. The body of each person was, is and will be a Temple of the Holy Spirit. How much more so the body of a Saint! The desire of the Holy Elder was that the end of his life would find him in his beloved place of repentance, in Kavsokalyva of Mount Athos. In his last moments he wanted to hide from the eyes of the world. Besides, God had glorified him in the world, since his fame crossed the borders of our small country. He wanted at all costs at the end of his life to hide from the world, confirming even at the eleventh hour his humility, but showing to all the high path of this virtue. Apart from the textual and historical inaccuracies of the professor, who may have fallen victim to misinformation and deception, there came to my attention also a second case. This time it was written, and even worse in a publication issued by the same hermitage the Holy Elder Porphyrios founded, that of the Transfiguration of the Savior in Milesi of Attica. The title of this book is From the Notebook of a Submissive (Από το σημειωματάριο ενός υποτακτικού). Unknown is the submissive, and unknown is the notebook. Among the contents, someone with the initials P.D. (who also is unknown) states: "According to all that the Elder told me we did his exhumation on 2/15 February 1995. At nightfall I took them (i.e. the relics) and buried them in a forest which I am not even able to find myself." I cannot explain why or how they dare write such inaccuracies! Our Elder had complete information from the Holy Spirit concerning the exact day of his venerable repose, which is why he guided us with absolute accuracy about what had to be done, and of course for his burial. To a brother who was a member of his brotherhood at Kavsokalyva, he gave clear instructions how to dig the grave and how deep, how to place large plates from Pelion, and where his body was to be deposited, so that there is no direct contact with the soil in order for it to dissolve quickly. The preparation for death was a celebration for Saint Porphyrios. The Holy Elder was the ultimate guide of spiritual unity. It is no accident that the last 35 minutes of his earthly life, he was constantly whispering the words of the High Priestly Prayer of Jesus: "That they all may be one, that they all may be one, that they all may be one." He confided to his whole brotherhood what should happen after his repose. His desire to "hide" was his earnest desire. "Theodore (my secular name), here they intend to do very horrible things for me. They want to put me in a glass container so the people can venerate me like Saint Nektarios" (such was his humility that he considered himself a sinner, let alone be compared to the great Saint of our Orthodoxy Nektarios). He continued: "But I'm not so dumb that I would find trouble with the Saints, so I will come up to Kavsokalyva. Can you help me and nurse my gardens? To plant beets, spinach, zucchini? You can even go fishing and catch us a little fish?" Nobody believed he would eventually come to Kavsokalyva to repose. Some claimed that since he was the Founder of the Hermitage in Milesi, there also would his tomb be so the people could venerate it and receive his blessing. But let us return to the P.D. mentioned in this book. There is and never was a brother monk with those initials at Kavsokalyva. I do not know if these initials are symbolically used. If yes, then what do they symbolize? Rather they are disorienting. If something is symbolic and no one can unsymbolize it, then it would be enough to make a vague reference to a brother of our Skete. But I have a personal view. I have a personal opinion since I was present at the translation of the holy relic of our Elder. Three of us were present. My humility, Father Ioannikios and Father Niketas. The exhumation of the reposed fathers at Kavsokalyva takes place three years after the burial. We thought the translation of the relic of our Holy Elder should take place a few days before the completion of three years. The most suitable date was found. It even coincided with the translation of the relic of Saint George, since the church of our cell is dedicated to Saint George. It was late at night when the translation was completed. The two brothers I previously mentioned, led the holy relic into the forest where it was secretly buried. Personally I refused to follow the two brothers, wanting to be ignorant of the place of his burial. Clearly they did not throw or scatter them to the four points of the horizon. "The Lord protects all his bones, not one of them will be broken" (Ps. 34:20). His humble venerable repose, the humble translation of his holy relic, as well as his hiddenness from the eyes of the world was consistent with what he said in life: "I do not want you to put me in photographs. I want you to put me in your hearts. I will be very close to whoever puts me in their heart."